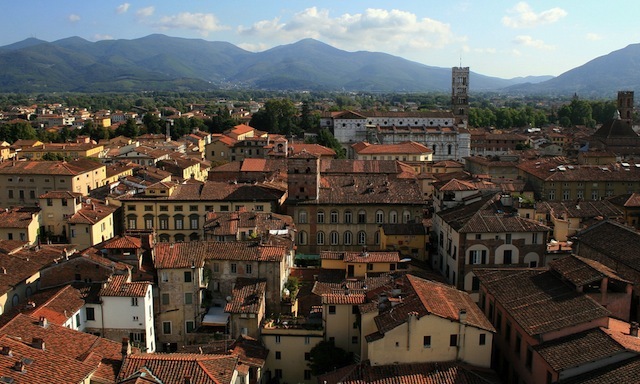 City of Lucca, Italy. Image via Flickr by bongo vongo. So what was the role of the bishop in medieval towns? These next three papers given last month at the International Congress on Medieval Studies tried to answer that question. We kicked off the session with Michael Heil (Hendrix College), speaking to us about Italian bishops in the Tuscan city of Lucca in, The Bishop as Judge and Litigant in the Towns of Early Medieval Lucca. This paper focused on 9th century court cases. Judicial decisions made by bishops are surprisingly elusive even though it’s a rather well studied topic. He chose to focus on the placeta, public court hearings. They were edited as a distinct corpus in the 1950s and have also been studied as windows on the landscape of the political and administrative scene in Italy. Over the first half of the 9th century, the administration of justice moved from clerics to laymen. These changes point to a process where the bishop lost his public rights. However, it’s not such a straightforward shift from cleric to lay hands as other historians have suggested. There were two distinguishable forms of justice in Lucca. Episcopal court hearings, which were distinct from the placeta. The disputants were both lay and clerical. Cases between clerics were handled differently from those involving laymen. Clerical cases were adjudicated by bishops and their ecclesiastical representatives, and those containing laymen were adjudicated by bishops and secular authorities. In both cases, bishops were the adjudicators, however, even if the claimants were both bishops, it mattered if there were laymen involved in the court case. There was a clear divide between ecclesiastical and secular justice which Heil suggests contradicts previous findings that indicated the bishop was the main point of judicial authority. Heil posed a few questions: Were cases between clerics handled differently? Did this change in the 9th century? Unfortunately, between 813-821, all the records show are cases between clerics and lay people. You have to look to the 850s for more information about cleric vs cleric disputes. There were two cases held in the episcopal domus, yet the cases have a secular character. In 857 another clerical case came to light, and was heard in the ducal court, oddly enough, by laymen, as in the secular placeta. Were the two cases in the 850s an aberration in protocol? You don’t see another case between clerics again until the 890s. In the early middle ages, most of the attitudes towards festival activities were retained from the classical period. Gradually, concern with clerical authorities grew over the perception of an “urban danger”. The precise nature of this danger would vary over the course of time. In the 11th century the concern with urban danger was imperilling the clergy’s souls. By the 18th century, it was focused on a imperilling a woman’s virtue. In the Georgian period, Hogarth’s Rake’s Progress, demonstrated that urban danger was performed by women. There was a concern with clerics finding their virtue under threat in large groups, such as festivals like the Send, hence the need for enclosure. However, enclosure wasn’t just for keeping one’s virtue intact, it was also to encourage the monks to perform their monastic duties together. “Crucifixion” (showing also also the archbishop Jacobus de Voragine with his book the Golden Legend in his hands.) by Ottaviano Nelli, Chapel of the Trinci Palace, Foligno, Italy. Last, we came back to Italy, this time focusing on Genoa, in Carrie E. Beneš’s (New College of Florida) paper, Civic Advice from the Archbishop: Jacopo da Varagine’s History of Genoa (1298). We turn once again towards the topic of vice: How did the ecclesiastical establishment deal with urban vice? Historical writing of the 13th century moved away from grandiose stories to a more encyclopaedic approach when trying to deal with teaching others the perils of vice. The rise of the mendicant orders and their teachings gave rise to the exemplum – an anecdote added to the sermon to assist in teaching and getting their point across. It’s a short narrative that demonstrates values the author wishes to impart and impress upon his audience. Varagine’s first five books were universal or etymological histories, and explained how Genoa came into being and how it was Christianised. The next four books, (6-9) offered moral advice for rulers, citizens and their families. The final two books were a chronology of the bishops of Genoa, and an Annalistic narrative. The entire history contains numerous exempla. Foundation legends are one of the main ways medieval authors conveyed pride in their past. In his first book, Varagine explained that Genoa was founded by Janus, the Roman God of beginnings and transitions. he then went on to say it was also founded by the the first King of Italy, and then another version where Genoa was founded by another Janus, citizen of Troy. Varagine employed three foundation myths mashed into one. Although it might seem strange to modern audiences, the fact that Jacopo found three Janus’s, to the medieval mind, cemented his view and legitimized it.